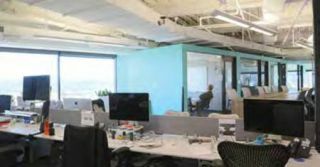 As a result of the huddle space and open office space trends, there has been an increase in demand for sound masking, for example, with this software company’s office featuring Cambridge Sound Management’s solution. When designing a more modern office space, collaboration is all the rage—instead of the high cubicle and individual office set ups, companies are now lowering the walls and creating larger, open floor plans with huddle rooms. Of course, while the idea of these open, creative spaces appeals to the productivity of meetings, sound leaking from the huddle rooms to other areas of the office can become distracting, leaving integrators with the task of masking that sound, so other employees are not disturbed. Huddle rooms and open plan office design have allowed integrators to expand their portfolio of product and service offerings. Office trends are more collaborative and interactive. As productive as the design intention is, it also creates distraction and discomfort for those around them. Sound masking is an accepted solution to cover, or mask, indirect speech. Sound masking is a tremendous option for creating speech privacy and comfort in those challenging spaces. Furthermore, although there are a variety of different types of sound masking systems, they are not complicated to install and tune. Lastly, depending on the size of the facility, sound masking systems are networked. Integrators add tremendous value here in understanding the systems, controls, installation practices and how it all ties together. They can be a great resource to the facility while also expanding their product and service offering. Open space environments with or without the “huddle room” have opened new opportunities, and perhaps more of them for acousticians and integrators to create sound masking solutions for clients through sales. However, these solutions may require evolved paths to get to desired results. A collaborative effort at the architectural level with the goal of workspace productivity and/or privacy would be warranted if possible. Masking in general is primarily presented as a solution to increase productivity, enhance privacy, or both. At first pass, traditional thinking would support increased opportunities for integrators to present sound masking solutions in open office spaces since many physical barriers such as walls, partitions, and/or doors are not present. By designing space to create a more open environment, masking can potentially take on a larger role assuming that there is still a desire to isolate voice or “soften” other audible sources. If one perceives huddle rooms exist to provide collaborative space supported by technology and connectivity as a replacement for private offices or meeting rooms with physical barriers, the ability to attain desired results with masking can be limited. The huddle space ideally will allow collaborative verbal communications while still maintaining a productive/private environment in both huddle and open work areas. In our Atlas Design Request Service, we are seeing more and more corporate offices adopting the open concept, whether it is new construction or a re-model of existing facilities. The cubicle dividers are either dropping in height or missing altogether in an effort for open collaboration amongst the office occupants. I call it creating a more “family like” work environment. A well-designed and tuned sound masking system will help replace some of the lost privacy in these open plan spaces at a reasonable cost. Atlas can provide a turnkey system quote (except wire and labor) with just basic information of the areas to masked. Typically, we ask for a good floor plan, ceiling heights and the plenum depth, and some info on the ceiling tiles being used in the space. More and more in modern office design, open space and glass are replacing cubicle partitions and funky open ceiling concepts are replacing drop ceilings. When you decrease materials that block or absorb sound, covering excess speech noise with sound masking becomes the only viable option for making the acoustical environment comfortable. As a result of the trend, we’ve noticed an increase in demand for sound masking from our integrator network. Kelleigh Welch is managing editor of SCN.